cold front moved in....had the fireplace on today. Tried to write, but was really too distracted. Well, we made the very difficult decision that it wasn't really working with Teddy. The woman who found him said, when she dropped him off last week, that if it didn't work out she'd love him back. that she was giving him to us because she promised....but in the meantime both she and her husband had fallen for him. Apparently she cried most of the way home. When I contacted her this morning with our decision, she said she'd come right over this afternoon. Have to admit, while I believed it was the right decision, it was so painful and difficult. There were all sorts of factors, of course, which I won't go into. But I spent much of this morning and early afternoon lying beside him, cuddling. And quite a few tears. But when she arrived, Teddy was almost hysterical with happiness. I felt a weight lift from my heart and I could see this was where he belonged. With her - and with other dogs he could play with. Still sad, but we have concluded Trudy is a one dog family puppy. And so are we. 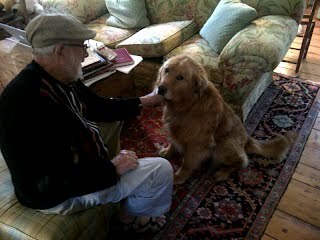 And God Bless Teddy, for coming and staying with us, giving us such joy - then going back to his real home. Leaving us wiser. Thank you for all your kindness and support. It's been a difficult day. But a good one. Huge thunder storms passed by here this morning. I actually quite like storms....used to love sitting in the screen porch and watching them arrive. Trudy doesn't seem worried, but the rescue dog we have, Teddy (for Teddy Bear) seemed pretty upset. Teddy, as you can see, is a large golden mixed with, yes, bear we think. But such a lovely temperment. A friend, Rhianna's grandmother found him abandoned and took him in, but didn't think they could keep him. We have him as an experiment, to see how Trudy does. I'll tell you, I've lost my heart to the big guy....but Trudy remains unconvinced. Michael is pretty happy either way. But in the meantime, he's wonderful. Off to the vet for the once over and shots. Then a summer groom tomorrow. Will let you know how it goes. Jeez, another thunder storm has just rolled in. Listening to Supertramp, Crime of the Century....ages since I last heard it. Still love it! Drove home from the village last night with the top of the beetle down. always such a pleasure. But was getting chilly. This morning was nice, but by early afternoon some clouds moved in - and now I'm thinking a sweater would be good. Will get the blue one, also flapping away on the clothesline in that photo. So comfortable. Well, I ended up tossing out much of what I did yesterday - but for me, that's progress. I always need to have words on the page, a starting point. Then I know if it's the right direction or not. Getting rid of them is never a step back, but a step toward getting it right. Replaced them with other words...fingers crossed I got it right-er. eh. 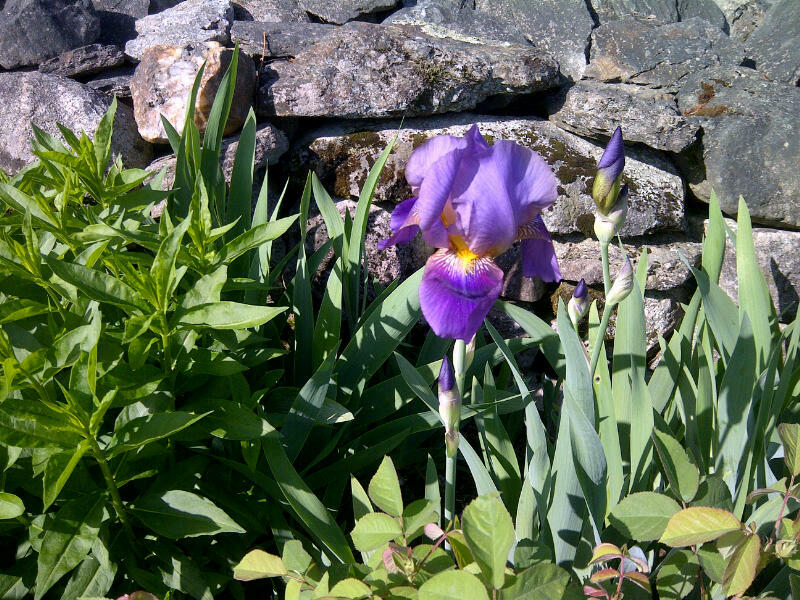 The first iris is out, others will probably pop before the end of the day. Writing on the screen porch. Lovely. Cucumber sandwich for lunch. Now it's summer! It's Memorial long weekend in the States - hope you're enjoying it. If the weather holds we'll put a couple of burgers on the barbeque for dinner tonight. We eat them with those thin President's Choice buns that look like a shaved puck, open faced, and figure it's the healthy choice. Ahhh, delusions. And burgers. A great combo. There were severe storm warnings out for Montreal and surrounding area last night - including tornado watches! About 11pm a huge storm blew through here. had to close the windows. But I hear not much, if any, damage was done. Awoke early today - breakfast with Michael on the screen porch - blackflies out in force! Pond walk was particularly bloody. Have finished with that difficult chapter - but keep re-reading it...mostly because I'm so relieved and pleased. One of my favorite chapters now. I think I also re-read it because I'm nervous about moving on. Easier to edit and smooth and re-read than to forge ahead. Ahhh - the mind. But forge ahead I will. In fact, have just started the next chapter...I find action a pretty reliable antidote to fear. Here's a photo of the laundry on the line yesterday, including my flannel writing top. as comfy as it looks! And, if you can see it, the single sock found in the bottom of the hamper. We found its mate later in the day. Our composter is that black box off to the right. Compost and laundry. not perhaps an ideal combination, but works for us. Happy Memorial Day Weekend for those of you who are American. Hope it's sunny and clear for all your picnics and barbeques and parties. Back to work-forging ahead. Ho! I can't tell you how much that meant to me. Not that your behavior is any of my business - but I have to say, I wasn't at all surprised, but I was gratified. I could see he meant it. I suspect the Manoir guests are generally nice people, but I could see that those of you who have discovered it through the books are even more amazing than most. Thank you for that. For making a place so meaningful to Michael and me, even more special by bringing your own kind spirits to it. As well, Franck, the maitre 'd at Hovey was delighted to tell me when he knows guests found the Manoir through my books, he introduces himself as Pierre - the maitre d' at the Manoir Bellechasse, from A RULE AGAINST MURDER/THE MURDER STONE. I can't tell you how much it means to me that where I live, and places I love, are so supportive of the books and characters. It would have been easy for people to find fault, or criticize, or be negative - but almost to a person they're kind and supportive and happy for me, and for the area. And how lucky I am to have you as readers - people so special that Marc-Andre was moved to make sure I know how wonderful you are. Back home now - peas and radishes coming up in the vegetable garden, where My Assistant Lise and Her Assistant Donna planted them. Peony buds round and promising. Roses almost out. Purple azelea (new to our garden) in full bloom. Alliums just out. It's such a fantastic time in the garden. Sitting at the laptop, about the begin for the day. Suddenly realized I need another file called 'second draft notes' - issues that have arisen, too late for the first draft. things I need to put into the manuscript, earlier. And will have to add in the next draft. I always think I'll remember them when the time comes, but honestly, by noon they've disappeared. Lay in bed last night and a piece of dialogue came to me - I wondered if I should write it down... vacillated - but finally roused and wrote it in the notebook by the bed. Thank heaven because this morning, while making the bed I saw the dialogue and barely remembered writing it, never mind thinking it. Course, the dialogue in the light of day was just ridiculous - but I live in hope. 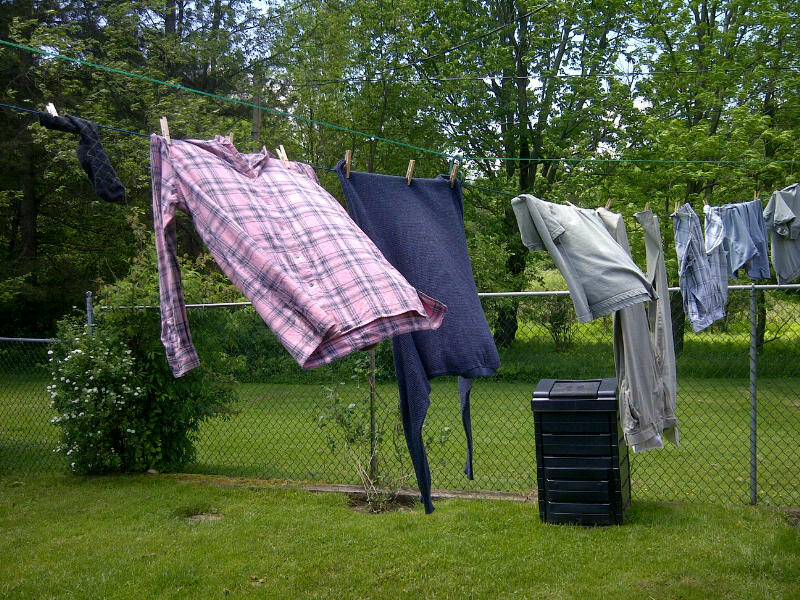 Fresh laundry on the clothes line - I can see it from where I'm sitting. Very relaxing. Hope you're well. Speak soon. Thunder storm warnings out for yesterday, but nothing materialized. Still, we thought it best to stay close to our cottage at Hovey. For safety sake, of course. Nothing to do with indulgence and laziness. Dinner last night was very fun with the three journalists - one from Toronto, one from Oregon and one from BC - though the last two run a travel blog for women called WAVE Journey. They're off today on the Gamache/Three Pines tour of the townships - from the general store in Georgeville, to Danny and Lucy's bookstore in Knowlton...and, of course, the night at Hovey. Oh, dinner last night. Michael, and almost everyone else, had lobster bisque then fresh magdellan islands lobster - I had the celeriac salad and halibut....but am eyeing the lobster for tonight. Halibut was fabulous - but have to admit, their lobster looked wonderful. I was worried I'd have to struggle with the shells - again, laziness - but it was already shelled. Will try to take a photo and post it tomorrow. Did more writing yesterday. Getting closer and closer to where I want/need this chapter to be. I hope, when you read this book, that you have no idea which chapter gave me such anxiety. I'll be successful if it is seamless, and reads as though I simply pounded it out and moved on. Lilacs in full bloom and honeysuckle and alliums just popping. Up to 35 degrees (over 90f I believe) yesterday. Scorching hot. A perfect long weekend day. In southern Canada the May long weekend is considered by many the unofficial start of summer. It's when summer cottages are opened, and annual flowers planted and some anxiety over more snow is lessened (but never gone completely). 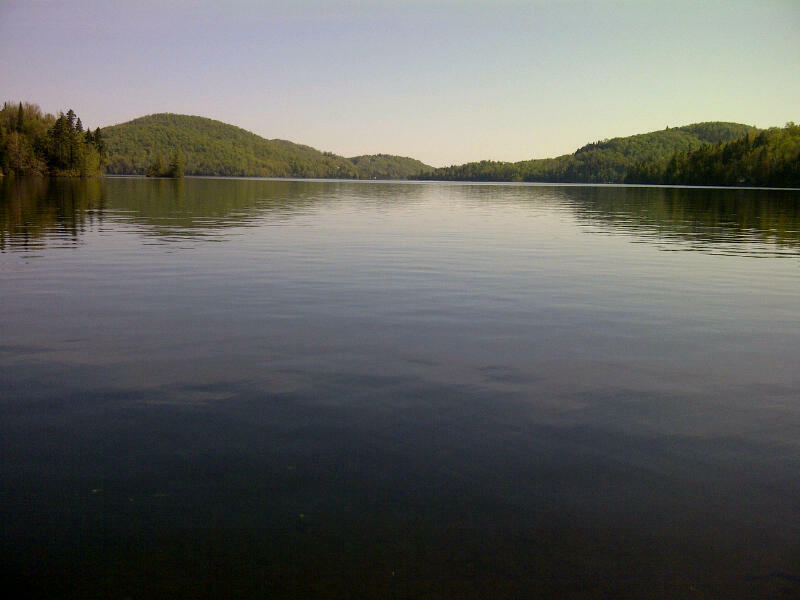 Doug, Michael and I got up at 5am hopped in the car and headed north, to the Laurentians, and lac Manitou - where we spend such blissful childhood summers. We packed a picnic and thermos of coffee - arrived about 8:30 am, sat on the dock, and drank coffee. I took this photo as we sat there. A more splendid day would be hard to find. then back in the car mid-afternoon for dinner at an Indian restaurant in Montreal. Doug stayed there, to head back to Toronto, and we came home. Didn't write yesterday, but sitting placidly on the dock, thinking of the Gordian knot I've created with this chapter, a few thoughts came. Not solid, but more a gleam on the horizon. Looking forward to returning in a few minutes to the manuscript and seeing what the day brings. Tomorrow morning we're off again - this time to drop the little volkswagon beetle in to have it's tires changed (we feel it might now be safe to remove the winter tires) - then heading to Hovey Manor on Lake Massawippi, North Hatley. I have an interview there with a journalist from Las Vegas, then a dinner with a Tourism Quebec official at Hovey and three other journalists who are on a tour very loosely based on local inspirations for the books. Looking forward to hearing about their day! Happy Victoria Day/Journee des Patriotes etc to you! What a beautiful day - again! So fortunate to have this warm, sunny weather fall on the long weekend! My brother, Doug, arrived from Toronto at 8pm last night. It was still light outside, and warm, so we sat in the garden and talked. Then he reported being awoken at just past 6am by a red-winged blackbird, gripped onto the screen at his bedroom window. Calling to him. I think you can imagine his response. Then, this morning as I started to write, a blackbird grabbed onto the screens of the living room window and for about an hour moved from window to window, as though it wanted in. Most disconcerting. I worried maybe it had lost a baby down our chimney and wanted in - but more likely it was claiming its territory. Hate to say it, but no matter how hard the blackbird might try, we're not moving out. 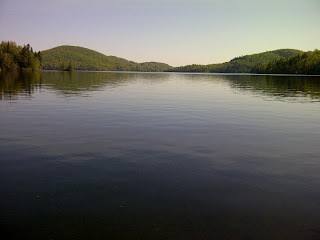 We're off to the Laurentians tomorrow, to Lac Manitou - just for the day. The forecast is for sunny and highs around 30 degrees - which is somewhere in the 80's I believe. Amazing. Glorious sunny, warm day here - as you can see, at least one of our lilac bushes is in bloom, the others are very close. Indeed, if you look closely at the photo you might see two geese who arrived this morning. No babies yet. 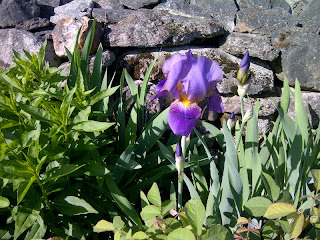 What a difference sunshine makes - everything seems to come alive. Hope you have a great weekend. Here in Canada it's the Victoria Day long weekend, Monday's a holiday. In quebec we don't celebrate (officially) Victoria Day. It's the Journee Nationale des patriotes - probably to get up the nose of the Federalists. Either way, most people simply care that it's a day off! So happy Victoria Day des Patriotes - bien sur! And it's supposed to be beautiful and warm and sunny all weekend. Wow. 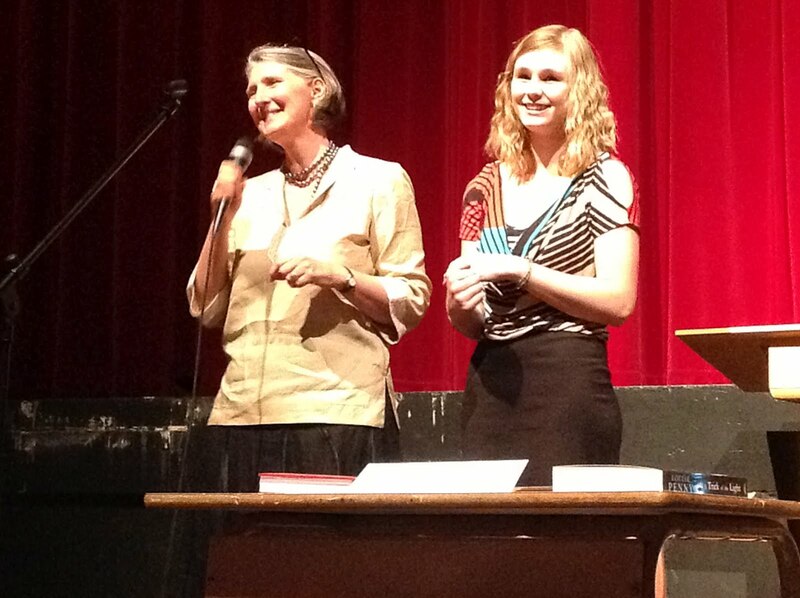 the other photo is of Meaghan Westover, the young woman who won the first annual Whitehead/Penny Award for Public Speaking. We felt strongly, Michael and I, that all the work that went in to learning public speaking should be recognized and rewarded. A good speech doesn't just happen. A good topic needs to be chosen, research done, thoughts organized. It needs to be written, edited, times, and memorized. Thanks to Patrick Fontaine and everyone at Massey-Vanier High in Cowansville for organizing the award and the assembly and making Michael and me feel so welcome. And congratulations again, Meaghan. Well, off to walk Trudy around the pond again. Be well - and I hope to talk with you tomorrow. Well below seasonable. But, as we say, better than snow - which is still a possibility! Internet went down again today. Just back now. Frustrating when wanting to say hi to you, but very frustrating when I need to do research or look at an attachment someone has sent. But, as I say, this is life in the country. Finished reading the latest draft of the film script for Still Life. Looking very good. Still a long way from actually happening, but this is a big step forward. Wrote this morning, then Michael and I headed to the high school in Cowansville to give out the first annual Whitehead/Penny Award for Public Speaking - to Meaghan Westover. VERY impressive young woman. Congratulations, Meaghan! And now home. Had a talk with publishers in NYC about the fall tour. Very preliminary. They're looking at options and logistics. The Beautiful Mystery comes out August 28th, and I'll be on tour for 2 weeks. It would be wonderful to see you on tour. Always a bit of a challenge, these book tours - as those of you who followed last years' might remember. But what makes it possible for me is all the great energy and enthusiasm I feel from you. It really is sustenance. I get back to my hotel room and feel it is all so worthwhile. And deeply thankful to have you reading my books. How lucky I am! I'm really hoping to have the second draft of the book I'm currently writing done by the time I head out on tour. The first two drafts are the most difficult, of course. Then, post tour, I can do the third draft and whatever else. My hope is to have this book in to the publisher before Christmas. It can feel, at times, like a bit of a slog. Writing almost everyday. And when I'm not writing, I'm thinking about the book. Every day. For a year. So fortunate that I really, genuinely, love the company of Armand, Clara, Gabri and the others. And that I have you for a reader. Chilly day, brisk wind here. 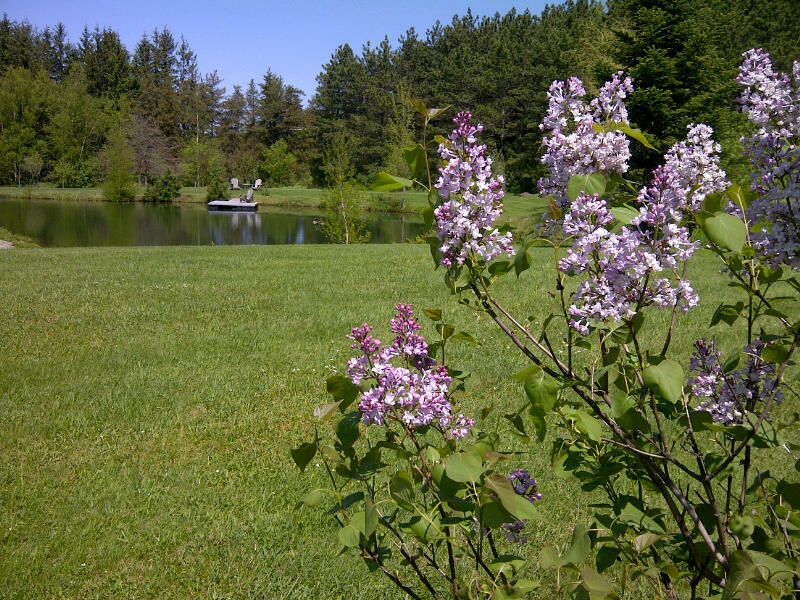 But the lilac are coming out finally. Will try to remember to take a camera on our next pond walk with Trudy. Michael is home! He and Vic flew from Glasgow to London, then London to Montreal. I met the plane Sunday night, with a dozen doughnuts. Not sure they remember me being there, but they sure made googoo eyes at the chocolate glazed. So amazing being home, and having Michael here. We haven't been together here in the country for almost 2 months. Barbequed a steak on Monday night and we sat on the new screen porch. Bliss. so peaceful. The rest of our days, Tuesday and today taken up with opening mail and responding to phone messages. Feels like we've fallen into a bucket of chores. I'm writing every morning, as usual....then in the afternoon try to get other things done, but often have a phone conversation scheduled with a publisher, or the film producer. Finished reading the latest version of the script for Still Life. Very much like it. I had a few notes, but not many. Very odd, though, to see what someone does with the story, the characters, the themes. And for me it's a struggle to find that equilibrium between making sure the film is true to the spirit of the books - and especially the characters - without needing the script to be slavish. When to hold tight and when to let go. Not sure I'm always getting it right - but learning. Off tomorrow afternoon to the local Cowansville high school -Massey Vanier - to speak with some of the students at their assembly and to give out an award Michael and I have established in Public Speaking. There are a lot around for writing, so we though, with the help of one of the teachers, Patrick Fontaine, it would be great to celebrate those students who find the courage to get up in front of their peers and deliver a speech. Very scary. What I think I'm going to do from now on, since I can't seem to blog as often as I'd like, is I'll put my facebook posts up on the blog...that way we get to stay in touch daily....and sometimes I'll add things, just for you. I know that many of you, who read the blog, were among the very first supporters of the Gamache books. And I'm forever grateful to you! So excited about The Beautiful Mystery coming out in a few months. I also know many of you followed the adventures in the monastery, as Michael and I did some of the research for the book. And now it will soon be in your hands. Beautiful sunny day yesterday, today am hunkered down by the wood fire. Rainy and cold outside. but having such fun writing. Odd to describe something often difficult and scary as fun, but it is. I think what I so appreciate is the peace and quiet to do it. to take my time. Trying to make each scene not only purposeful, but beautiful. And multi-facetted. I'm under no illusions that I'm succeeding - but nice to have a goal! Sometime when I start a scene I think I know what it's about, only to find partway through that that's changed. First drafts are always tricky for me. I find them deeply intimidating. The balance in a first draft, once I get underway, is between seeing where inspiration takes me, and being driven way off course by a fuzzy idea...being, in essence, directionless. So my goal is to have direction, but to not dictate how we get there. Have finished for the day. Michael called a few times yesterday from Scotland but I missed the calls! then I called back and chatted with Vic but just as he passed the phone to Michael the line went dead. We weren't able to reconnect. A couple emails, though, but not the same as hearing his voice. But it sounds like they're having huge fun! Went to St Andrews Golf Course and Blair Castle. Michael took the photo from the top of the castle, which is between Perth and Inverness. They had Haggis for dinner last night - for the second time on the trip. I think he's getting a little tired of haggis. I hadn't the heart to tell him that Bob and Gill, our neighbours, brought over lobster last night - knowing I don't cook much. It was their kind way of having me for dinner, without my needing to actually socialize. And I'm so enjoying being home. Wonderful to be with Trudy. In fact, I must take her around the pond. When we left there was ice in the pond, now the fish are swimming around. Tulips are out and the house is filled with cut flowers from the cutting garden. My Assistant Lise (patent pending) came by yesterday afternoon and I signed some ARCs and did some other things. We also toured the gardens - My Assistant Lise is also Our Gardener Lise. We discussed the winter kill (some rose bushes) and where to put the sweet peas. And how to hide the hideous white propane tank. How peaceful it was, in the sunshine, to stroll with Lise and Trudy through the garden. Hope you're enjoying May so far! A wonderful day - finally. It has rained steadily - and anyone in England can tell you exactly the day the deluge started....the day after the government declared an official drought. Now, just to be contrary, apparently, despite an epic and historic amount of rain (it was the coldest, rainiest April since the Romans invaded, and frankly had they met this, they'd have turned around and left) there is still, officially, a drought. Wiser heads than mine work these things out...I suspect it takes a long time to create a drought and a long time to climb out of it. Happily, the UK has so much going for it, that we really don't care about the rain. Although, having said that, when the sun finally comes out, what a difference that makes. Michael and I head out and walk and walk. Yesterday we walked over to one of our favorite little areas of London...Chelsea Green. Had fish and chips at Tom's Kitchen, signed books at Waterstone's, and walked home. Via - Laduree. Picked up two of the most decadent pastries we could find. Yum! I can't believe that five weeks have gone by, and it's time to head home. I'm catching a flight tomorrow evening back to Montreal. Michael and his son Victor are heading for Scotland, for a tour. While there they'll be meeting the remarkable Linda Lyall, who designed and manages my website, and the newsletter. We've never met! Email almost every day, since before Still Life was published in 2005...7 years. And have never even spoken on the phone. But we exchange gifts and photos....we know her children almost as though they were our own grandchildren...Christopher and Jennifer. I so wish I could meet them too. They whole Lyall family is going out for lunch to a traditional Scottish restaurant with Michael and Vic. It has been a really enchanting time. Busy without being hectic....and yet, there are still so many things we didn't get to do. My professional goal - besides meetings with my agent and publishers and booksellers - was to keep up the writing of the next book. I thought I'd just take it easy, but I discovered something I didn't know about myself and my writing rhythm. It is harder for me to slow down than it is to just go at the regular pace. I love writing every morning. Our routine here in London has been very simple. Every morning Michael goes across to the coffee shop, across the street. I prepare bowls of fruit. He reads the paper and has breakfast in the living room. I write, and have breakfast in the kitchen. Bliss for me is to have days when there is nothing scheduled....I can write as long as I want - (almost never beyond 1pm) then Michael and I head into the city. have lunch out. Walk. Just enjoy ourselves. And then we do the same thing the next day. My goal when we arrived in the UK at the end of March was to hit 40,000 words in the new manuscript. But this morning I did a word count and it's at 52,000. About half way through the first draft. Of course, there will be a second and third and fourth draft, but I always breath a sigh of relief when the first draft is nailed. Another couple of months....but getting there. And I do enjoy the company of Gamache and clara et al. We also had a great visit down to Kent, to have sunday lunch with a woman we met in Jamaica. One of the funny sorts of things where we didn't expect or want to make any friends...really, we just wanted to be left on our own, in peace. But the people were so warm, such good company....over the course of two weeks we just slowly were drawn together. I imagine that's happened to you too. As I say, home tomorrow. I'll miss Michael terribly...hate to be apart, actually. But I know he's having a great time with his son. And this allows me time to totally focus on the writing. Oh, congratulations to Margaret Maron - who has won the Agatha for Best Novel for Three Day Town. And, in other news, May is Crime Writing month in Canada, and the CBC is celebrating it with a special edition of Canada Writes click here visit the website. All this month is dedicated to crime fiction - and giving tips and 'workshops' for those of you who'd like to write your own book. Join us!